Metropolitan Ceramics has long been the industry's leading quality unglazed quarry tile for indoor & outdoor applications. Metropolitan quarry tile is an extremely durable 1/2" thick ceramic tile manufactured by the extrusion process, not pressed. The tile comes in a variety of shape & color options, with a low absorption body & tight die skin surface. Metropolitan quarry tile is slip resisting, resists impact & abrasion, & can be used indoors or outdoors in any climate. 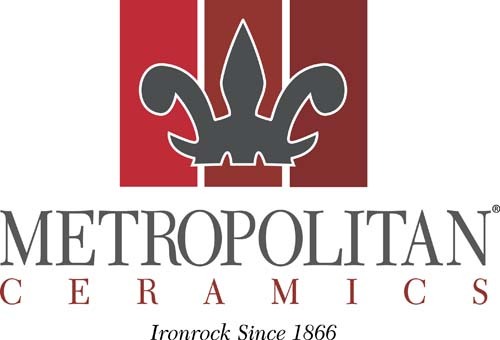 Metropolitan Ceramics is a product of Ironrock, located in Canton, OH. Ironrock is a member of the USGBC & The Tile Council of NA. Metropolitan Ceramics products are by their nature a good environmental choice. To broaden their environmental appeal, Metropolitan Ceramics has introduced Enviroquarry. Color changes in the manufacturing process of the Metropolitan Ceramics prodct lines creates an unfired scrap waste-product that cannot be added in large quantities to Metropolitan's normal production runs. This, in combination with fired scrap, constitutes a large amount of material that was previously part of the waste product of the production process. By special blending material with a lesser amount of virgin raw material, Metropolitan is now able to manufacture Enviroquarry with a large pre-consumer recycled content, diverting hundreds of tons of material from the waste stream. Metropolitan Ceramics unique product, Down to Earth, combines the durability and slip resistance of commercial flooring, with textures, distinctive sizes, and random color variation that will appeal to both the residential & commercial market. For use indoors & outdoors, Down to Earth will also appeal to the consumer trends toward enhanced outdoor living & more natural indoor environments. Metropolitan Ceramics other product lines include QuarryBasics, an unglazed ceramic quarry tile offering the combination of long wear & great looking colors & shapes. The colors coordinate to fit high traffic multi-use commercial & residential design needs. The line also includes QuarryBasics X-Colors & Metro Tread, products that meet the ADA guidelines for slip resistance as manufactured. With a coefficient of friction that meets or exceeds .90 dry & .70 wet at time of manufacture, look to these products for added slip protection. Finally, the line includes the Somerset colors. Somerset is a premium kiln produced shade variation ceramic tile manufactured without the use of glazes or additional surface treatments. Somerset ceramic tile combines strong earth tones, mellow ranges & deep hues with through-the-body color. Ironrock, a fifth generation family owned company, blends quality craftmanship, the latest technology and more than 140 years of ceramic manufacturing experience in making Metropolitan Ceramics products. Ironrock uses Ohio clays & shale- considered to be some of the best in the country- in the manufacturing process.